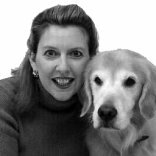 Emma Parsons, author of Click to Calm: Healing the Aggressive Dog (KPCT, 2005), is a canine behaviorist and trainer. We spoke to her recently about her life with dogs, and how she developed the innovative clicker-based techniques presented in her book. Who was your first dog? The first dog I can remember was Coco, who we brought home from a shelter when I was four or five years old. My family had a lot of dogs while I was growing up, but Sayle, a Springer spaniel, was the first dog who knew any behaviors on cue. He was an old hunting dog who was given up by his owners because he didn't hunt very well. He was the first dog with whom I did any training. I had always known, though, that when I grew up I would have dogs, and I would train them because I wanted to be able to take them places safely. My first dog as an adult was Corey, an American Eskimo we gave to my mother, but I ended up training him. I did well enough that I got another dog, Casey-Lynn, a keeshond, to be my first competition dog. She did well, getting her AKC Companion dog title, although she couldn't go beyond First Level because of elbow dysplasia. I still have Corey and Casey-Lynn, although they're getting on in years now. How did you first become, or consider becoming, a professional dog trainer? I took both our dogs to training classes, and discovered that I was good at it, and enjoyed it. In 1991, George Hansen at New England Dog Training Club, where I was a member, asked for help training a large beginner class. So I volunteered. The first night, George said, "Okay, see that group of people over? That's your class, go teach them." I had never taught a class before, but he said, "I've seen you train your dogs. Teach them what you know." So I did, including how to sneak food rewards into the class, which wasn't allowed. At that time, choke collars were the standard way of teaching a "down." So I showed them how to train "down" according to the club's guidelines, i.e., by stepping on the collar until the dog lay down or choked, and then told them how to teach the same behavior with food treats at home. So they all taught "down" at home with positive reinforcement and did great. Then we worked on "stay" in class. Everybody liked my class, and I continued to teach at the club for eight or nine years. Eventually I became president, and slowly, slowly positive reinforcement, food reinforcers, and friendlier collars became accepted. I still didn't really think I'd become a professional dog trainer. I was making my living as a graphic designer, and needed to do that, although if I hadn't chosen that field, I probably would have done something in the field of animal behavior. If I hadn't done that I would have done some sort of animal study. When did you get Ben, and why? I got Ben, a golden retriever, in 1996 because I wanted to raise a talented competition dog from a puppy, and do everything right every step of the way. (By this time we had added Nicholas to our pack; Ben took the spot of Kaeley, who had passed away from a brain tumor at the age of 3.) Ben's dad was a beautiful working dog, and while keeshonds were my breed , I thought I would go with a golden retriever for competition. One of the reasons I chose a golden was that I definitely didn't want to deal with any aggression. Ben was the pick of the litter, without any history of aggression in his parents, and none that ever appeared in his littermates. My breeder urged me to work with Patty Russo, in part because she did not do any aversive training. All went well; Ben was a great learner and loved training. When did you realize Ben had an aggression issue? It was hard to realize what was happening because he was doing so well in his training. I worried about it when another dog nipped him and he growled back. Now I know that his response was perfectly normal, but then it made me nervous. I didn't do anything about it, however, being a positive trainer and ignoring what I didn't like. But then I noticed that Ben would become more and more agitated when he saw strange dogs, even though he lived peacefully with my other dogs. So I took him to a trainer who specialized in treating aggression. That training session is described in some detail in my book, but in short, that trainer's technique was to hang Ben from his prong collar until he he was so terrified that afterward he urinated and defecated in fear. In retrospect, that hanging created and solidified Ben's aggression problem. After that experience, everything in Ben's world became a threat. Before, he was just being a clumsy ding-dong adolescent with other dogs. Afterward, he became a post-traumatic dog who was afraid of everything, from other dogs to paper bags rolling down the street. His aggressive displays were extreme and terrifying. Ben would aggress at the slightest stimulus until he frothed and vomited. I realized my choice was to find some way to rehabilitate him or to euthanize him. I quit my job, and went searching for information on aggression and ways to help Ben. I talked to everyone, read everything. Many other trainers gave me great ideas; Leslie Nelson, for example, urged me to train a rock-solid recall. Other trainers told me it was my fault, saying "You need to improve your relationship with your dog." I knew that wasn't right. I trained Ben five days a week at least an hour a day; we had, and still have, a great relationship. The suggestion was that if my training was better and our relationship h3er, I should be able to say one word and Ben would stop aggressing. That was ridiculous. When Ben was aggressing, he was unaware of anything. My husband could pick him up and carry him to the next room and he would still be aggressing. I had first heard of clicker training at an Association of Pet Dog Trainers conference. Then, when I was accepted to the National Association of Dog Obedience Instructors, I went to their conference in Hawaii where Karen Pryor was keynote speaker. One day, I saw her eating her lunch and I walked up and introduced myself, and then told her a little bit about Ben. She said, "Just start clicking him." I said, "When? For what? When he's aggressing, he doesn't stop." I remember her saying, "But he does breathe, doesn't he?" Yes, he had to take breaths to keep up that intensity of display. Karen said, "Begin by clicking when he takes in a breath, if that is his only quiet spot." It was a eureka moment for me. Up until that point, I knew of trainers rewarding for the absence of the behavior, but thought there was nothing you could do while the behavior was happening. It was the first time I had heard of the concept of differential reinforcement for low intensity of behavior. Until then I had no hope. Finally, someone had told me what can be done during the display of unwanted behavior. With the clicker you can make "dents" in the behavior; you can respond positively during an unwanted behavior. What Karen was really saying was, "Become a thinking being yourself; act while the aggressive behavior is being exhibited rather than afterward." That was the very, very important piece of it. Everything else was just building on that on that concept. Now when I am working with clients with aggressive dogs, I find out what the triggers are for their dogs' displays, and teach the owner both how to avoid those triggers as well as how to shape a more appropriate response. Initially we are shaping an emotion, rather than an actual behavior. Owners usually need to tell me why they think their dogs are aggressive, and usually why they feel guilty about it, and I let them. But then I tell them that it's no one's fault and none of that matters anyway; let's move forward. I'm there to teach them how to make it better, not to tell them what they did wrong. I give them the tools to reduce the behavior and replace it with an acceptable behavior. Then they can begin to build a new, positive relationship. If I can empower my clients with an understanding of behavior and the learning that produces it, they can perform miracles. Learning theory, after all, is the same no matter the species, even though we are capable of different things. This approach works well because once a person understands the basics of learning theory, all their interactions with their dogs improve and many problems disappear spontaneously. In your book, you write about putting canine calming signals on cue. How does this technique help aggressive dogs? There is an idea out there that if you put canine calming signals on cue—the head turns, play bows, and other behaviors dogs do to communicate peacefully with each other—that you are interrupting and hindering normal canine interaction. It's true that we can't speak "dog" and we can't read their minds. With dogs that are debilitated by aggression, however, dogs who cannot communicate normally, putting calming signals on cue offers several key benefits. Alexandra Kurland, author of Clicker Training Your Horse, cues horses to put their heads down because, when their heads are low to the ground, they become calmer. That natural behavior has a physiologic effect on the horse, whether it is done spontaneously or if it is cued. I wondered if I could teach Ben some behaviors that were physiologically calming, so I did, and it worked. Turning his head toward me, or turning around in the crate when other dogs come near him are just behaviors, but they help him stay calm, and teach him what do to in certain situations to feel safer. Knowing these behaviors gives him options other than aggressing. When a dog learns a cued behavior, they subsequently they learn what to do in these situations. They start to understand that they have some control over their environment, and begin to feel less fearful. A cued behavior can become a spontaneous behavior. When Ben was in his crate, he turned away from other dogs when I cued him. He then began learning that turning away made the threat go away because he could no longer see the threat. He was reinforced for the behavior, even when I was not there. Now he'll do it on his own. Giving him something to carry in his mouth, a task to distract him from other dogs, was another trained behavior he has adopted as a way to calm himself. With a highly reactive dog, a cued calming signal will interrupt the flow toward aggression. Clicking and praising the flow of appropriate greeting signals between two dogs is likely to stop the flow of signals, and is therefore unhelpful. In highly reactive dogs, however, the pause caused by the click and a substituted behavior interrupts the signals that lead to aggression; it can keep the interaction safe and successful. The ability to greet appropriately is then learned in "tiny pieces" and gradually grows over time. If I have a dog on a leash, and I can cue a calming behavior—say a head turn—I can help him feel calmer when another dog or threat approaches. Any cued behavior will give a dog a job to do that will distract them. So why not also cue a behavior that physiologically calms them down? My feeling is, let's get everything going in the right direction all at once. Let's teach our dogs signals that make them feel good and calm. We can't speak their language for them, but we can to substitute a calm and useful behavior for a reactive behavior. When did you develop Clicker Home Management, and why? Most dog owners don't realize that dogs are learning all the time. They forget they are interacting with their dogs all day long. My Clicker Home Management principles are a way of bringing some method and consistency to that constant interaction. Dogs need us to be their caretakers and their guardians because they live in a human world, not a dog world. Aggression, for example, is a normal canine behavior. What makes it inappropriate is that dogs happen to live in a human household. To be our dogs' caretakers and guides in our world, we need to be clear with them, patient, and positive, and base our interactions on learning theory. So I give clients three or four tasks to work on that require the clicker. The clicker provides clarity as well as safe hands-off management that the reactive dog requires. Performing a task inherently puts an owner in a proactive leadership role. And these are exactly the things that a reactive dog needs: leadership, clarity, and safe management. In your book, you include a chapter on creativity. What does creativity have to do with clicker training? What does it have to do with canine aggression? Creativity, or free shaping in terms of clicker training, helps reactive dogs learn how to think. These dogs use aggression as their normal form of communication. We need to teach them how to open their brains and access different forms of behaviors. We need to teach them to enjoy learning and to expect new experiences to be fun. Free shaping accomplishes that. Ben was once afraid of all agility obstacles. I decided to see what would happen if I free shaped the obstacles. Suddenly he began to frolic. I thought, this is my puppy again! He's been a forlorn old man, and here he is a puppy again. I saw him loving to think and work. New things were no longer a threat. It made me want to go on. Free shaping also teaches owners better timing skills, how to think on the fly, and teaches them to lower or heighten criteria appropriately on the spot. It helps owners become thinking beings as well as guiding the dog to become a thinking being. I teach my clients to be come trainers and thinkers. If I succeed, they don't need me anymore. That's what my book is about: how to learn to train and think on the spot. I want owners to get to the point where they can actually have fun with their dog. They're amazed when they see their dogs think and figure things out. It's a thrill to discover that there is something else in their dog's brain besides aggression and fear. The really amazing thing is that creativity releases humans from aggression and fear too. Free shaping and clicker training can relax a person and make them more confident as well. What's next for Emma Parsons? I'm currently offering Click to Calm seminars and workshops. My seminars were designed to, first, give the owner of the reactive dog more behavioral tools to work with and, second, to teach owners how to manage their reactive dogs more effectively so that the reactivity will decline in intensity and eventually cease altogether. Through the use of the clicker, in addition to building incompatible or other behaviors, we can also shape the emotions themselves in small successful approximations. The end result is that the formerly reactive dog will remain a thinking dog when confronted with the aversive stimulus. From here, the owner can maintain the dog's attention and can then cue a previously learned behavior which is incompatible with the aggression. Hence the aggression and reactivity will no longer be practiced. It's been very exciting for me to be able to help people with dogs like these. (Of course I speak through experience with Ben.) We're in a category all by ourselves. It is not easy to deal with this type of behavior on a day-to-day basis. Many of our own personal relationships can be aversely affected: spouse, children, friends, etc. Just being able to get some of these dogs in the training building with no explosions give the owners hope. We don't ask for miracles, just for a dog that appears "normal." In the seminars, my main goal is to give the owners as many tools as possible and then they can hopefully incorporate chosen pieces into their own private lives. I've just started the Click to Calm e-mail list for just that purpose: so that students can keep in touch and give each lots of support. In addition to the seminars, I'm considering returning to school for a master's degree. And I'll be doing some more writing. Submitted by Virginia Kowal on Thu, 2009/06/18 - 2:20pm. I am aware of the Sept 25 class at Masterpeace and was wondering if Ms. Parsons is available for a private class before that time. I live in RI but will drive to Mass. My dog is a 9 lb. female poodle rescue. She is my third poodle rescue. She is very aggressive to other dogs and people - hates everyone but me. We have had 4 different trainers here for 1 class and have attended 2 series of basic obedience. Host a Click to Calm Workshop!